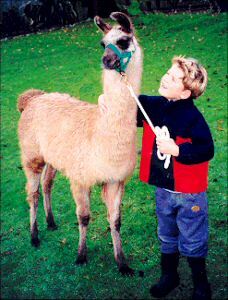 Llamas were used as beasts of burden (although they were never ridden) and could carry up to forty-five kilograms. They also provided meat, milk, wool, and dried dung for fuel. However, the fibre they produced was of much lesser quality than that of the related Alpaca, and outside their own country have mostly been regarded as a curiosity. The first Llamas reached New Zealand in 1865 – imported by Barnard Rhodes – and other small shipments arrived later, but for many years they were almost entirely confined to zoos and game parks. More recent importing has supplied new bloodlines, leading to an increased population, but there are still fewer than two thousand in this country. These are kept primarily as pets and companion animals, and also for the production of fibre – and they are becoming increasingly popular on smallholdings.